This is one of my absolute favorite fish dishes. For it is simply amazing! It takes me back to Morocco’s beaches, where the Mediterranean wraps and a slight breeze from the Atlas mountains a nice evening to sit and eat this dish. 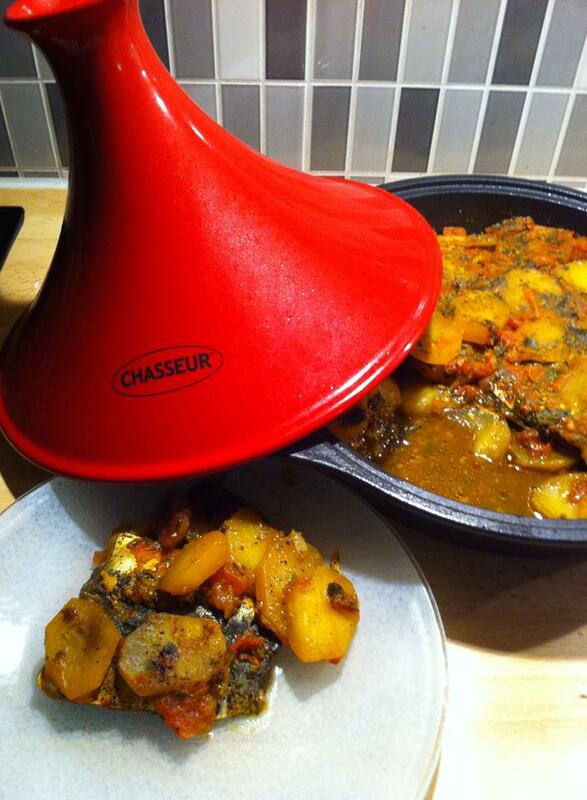 The spices together with the garlic and the fish cooked in tajine enables the dish is both juicy and full of flavor. Start with oil in the bottom of tajinen with oil. Then place a layer of potatoes. Then take two herring fillets and place flesh side against each other. And place the fish on the potatoes. Take half of all the spices and seasoning on the fish. Next, add another layer of potatoes and remaining spices and parsley. Sprinkle with tomatoes. Turn on the water. Put on tajine lid. Let it boil with medium heat , then lower to the second lowest heat. Let it boil for about 30 minutes or potatoes are done . Eat and enjoy , preferably with a good bread . Sound almost like something we call AKNE (not sure of spelling) around here. It’s a South African Muslim/Malay dish. cooked in layers like that and includes rice and beans sometimes and then baked in the oven to dry it out a bit so that it’s not soupy or stew like. lol my other problem is that i also hate biting into herbs and funny corns and things, and that’s what’s in a lot of recipes around here. Like cardamon seeds! eeeuw or biting into actual bay leaves. thought i think someone once told me you need to put those leaves and seeds in a little baggy? and then cook it in your food and then when the meal is done, just remove the bag? I went to Morocco last spring and the foods were so amazingly good.. I wanted to get a tangine since they are so cheap there but it didn’t fit my luggage. How much would you say it costs to get one here? Love tagine, love fish, love the spices… now if only I could get my hands on some herring! Is it more like trout, or sardines, or mackerel? My sources are confusing.